You are currently browsing the Archaeofacts.com archives of Musings for the day Thursday, October 23rd, 2008. One of the notable things about today: it was rather windy with no hurricanes around. That’s kinda strange for these parts. I didn’t have any good ideas for illustrating wind, since a tree with leaves flipped over by the breeze doesn’t necessarily look like it’s been affected by a strong airflow. That lead me to think about waves, and I sure have wave pictures. Then I thought I’d like to have a twist on the concept, so, voila!, here’s an original painting done by my grandparents’ friend Harry Surrell in 1966. 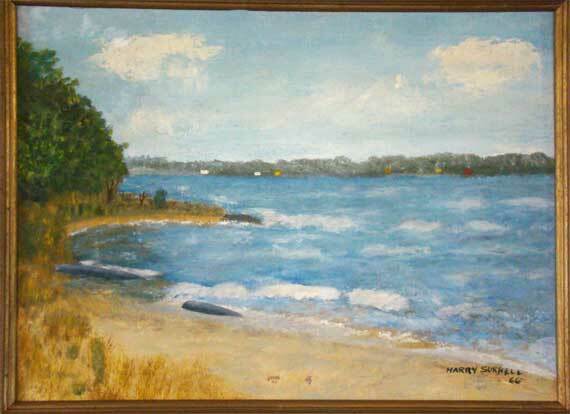 He was a dentist (I think) in Newberry, and this is our beach, with the big point I remember from my childhood. Now, the beach configuration is somewhat different (last year; the water’s higher this year…), and there are ever so many more houses on the far shore….